TU, Institute of Engineering (IOE) has published the entrance exam results and admission notice for the various constituent and affiliated colleges for BE/B.Arch. The entrance exam held on 18 to 30 Sharwan 2075. A total of 6,335 students passed the entrance examination. Check TU BE/BArch. 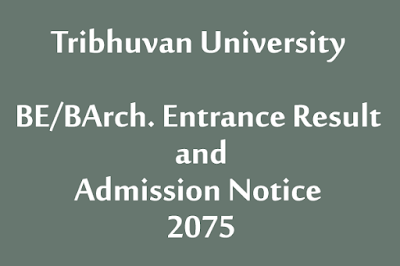 Entrance Result and Admission Notice 2075 below. We take this notice and results from the official site of Tribhuvan University Institue of Engineering.